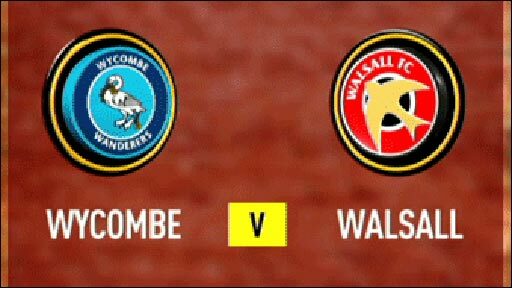 Wycombe remain rooted to the foot of League One after Walsall fought from two goals down to win at Adams Park. The hosts took the lead when Reading loanee Scott Davies lobbed a free-kick over Clayton Ince and Davies doubled the lead from the edge of the box. But the Saddlers hit back after the break as Steve Jones slotted in from Matt Richards' pass and then Mark Hughes lashed in a loose ball for 2-2. Jones then sent Alex Nicholls clear to fire home the winner late on. 90:00+1:12 The game is over, as the referee blows his whistle. 89:50 Shot by Jon-Paul Pittman. Inswinging corner taken from the left by-line by Matt Phillips. Blocked by Mark Hughes. 84:01 Booking Alex Nicholls is given a yellow card. 82:59 Assist on the goal came from Steve Jones. 82:59 GOAL - Alex Nicholls:Wycombe 2 - 3 Walsall Alex Nicholls finds the net with a goal from inside the box to the bottom left corner of the goal. Wycombe 2-3 Walsall. 82:27 Booking Caution for Netan Sansara. 81:45 Corner taken right-footed by Matt Phillips from the right by-line, Effort on goal by Scott Davies from outside the penalty box goes harmlessly over the bar. 79:35 GOAL - Mark Hughes:Wycombe 2 - 2 Walsall A goal is scored by Mark Hughes from inside the penalty box to the top right corner of the goal. Wycombe 2-2 Walsall. 79:15 Booking Craig Woodman receives a caution for unsporting behaviour. 78:58 Matthew Richards takes the inswinging corner, save by Scott Shearer. 78:38 Shot by Steve Jones. Save made by Clayton Ince. 77:41 Netan Sansara delivers the ball. 77:18 Scott Davies produces a left-footed shot from deep inside the penalty box which goes wide of the left-hand post. Correction - 76:12 Shot by Scott Davies. Clayton Ince makes a fantastic save. 76:12 Scott Davies takes the chance to get an effort at goal. Save by Clayton Ince. 75:03 Corner taken by Matt Phillips, Scott Davies produces a right-footed shot from just outside the box that misses to the right of the target. Correction - 73:59 Scott Davies delivers the ball, Effort on goal by Matt Phillips from deep inside the area goes harmlessly over the bar. 73:59 Centre by Scott Davies, Matt Phillips produces a right-footed shot from inside the area that clears the crossbar. Correction - 72:39 Free kick taken by Clayton Ince. Correction - 72:39 Substitution Jon-Paul Pittman is brought on as a substitute for Matt Harrold. Correction - 72:39 The assistant referee signals for offside against Matt Bloomfield. 72:39 Substitution Jon-Paul Pittman is brought on as a substitute for Matt Harrold. 72:39 The offside flag is raised against Matt Bloomfield. 72:16 Craig Woodman crosses the ball, clearance made by Emmanuele Smith. 71:46 Effort on goal by Scott Davies from just inside the penalty box goes harmlessly over the target. 71:14 The assistant referee signals for offside against Darren Byfield. Direct free kick taken by Scott Shearer. 71:03 Rhys Weston sends in a cross. 70:00 The ball is crossed by Matt Bloomfield, Shot on goal by Matt Harrold from inside the box goes harmlessly over the target. 69:02 The ball is sent over by Matt Phillips. 67:57 The ball is crossed by Matt Phillips, clearance by Emmanuele Smith. 67:21 Substitution Matt Bloomfield joins the action as a substitute, replacing Chris Zebroski. 66:58 Steve Jones is flagged offside by the assistant referee. Scott Shearer restarts play with the free kick. Correction - 64:40 Matthew Richards takes the inswinging corner, save by Scott Shearer. 64:40 Corner taken left-footed by Matthew Richards from the right by-line, save by Scott Shearer. 59:56 Chris Zebroski sends in a cross, Emmanuele Smith manages to make a clearance. 58:33 The assistant referee signals for offside against Darryl Westlake. Michael Duberry takes the direct free kick. 55:09 Booking Steve Jones receives a yellow card. 54:55 Matthew Richards provided the assist for the goal. 54:55 GOAL - Steve Jones:Wycombe 2 - 1 Walsall Steve Jones finds the back of the net with a goal from close in to the bottom right corner of the goal. Wycombe 2-1 Walsall. 49:49 Matt Phillips delivers the ball, Scott Davies produces a right-footed shot from the edge of the box and misses to the right of the goal. 48:40 Free kick awarded for an unfair challenge on Darren Byfield by Tommy Doherty. Mark Hughes takes the free kick. 45:44 Darren Byfield sends in a cross, Michael Duberry makes a clearance. Correction - 45:23 Substitution Peter Till leaves the field to be replaced by Alex Nicholls. 45:23 Substitution Darryl Westlake is brought on as a substitute for Peter Till. Correction - 45:15 Substitution (Walsall) makes a substitution, with Steve Jones coming on for Richard Taundry. 45:15 Substitution Netan Sansara leaves the field to be replaced by Steve Jones. 45:00+4:33 Matthew Richards delivers the ball, clearance by Michael Duberry. Correction - 45:00+3:18 Substitution Darryl Westlake replaces Peter Till. 45:00+3:18 Substitution Jon-Paul Pittman is brought on as a substitute for Matt Phillips. 45:00+3:00 The match has reached half-time. Correction - 45:00+0:53 Matt Harrold gives away a free kick for an unfair challenge on Darren Byfield. Emmanuele Smith takes the direct free kick. 45:00+0:53 Darren Byfield fouled by Matt Harrold, the ref awards a free kick. Emmanuele Smith takes the free kick. Correction - 36:58 Assist on the goal came from Matt Phillips. 36:58 Assist by Matt Phillips. 36:58 GOAL - Scott Davies:Wycombe 2 - 0 Walsall Scott Davies grabs a goal from the edge of the penalty box to the bottom right corner of the goal. Wycombe 2-0 Walsall. 36:58 GOAL - Scott Davies:Wycombe 2 - 0 Walsall Goal scored by Scott Davies from the edge of the penalty area to the bottom right corner of the goal. Wycombe 2-0 Walsall. 35:11 The ball is crossed by Rhys Weston, Scott Shearer makes a comfortable save. 30:07 Matthew Richards takes a inswinging corner to the near post, Leon Johnson makes a clearance. 28:27 Scott Davies is ruled offside. Clayton Ince takes the free kick. Correction - 27:34 Free kick awarded for a foul by Darren Byfield on Michael Duberry. Direct free kick taken by Scott Shearer. 27:34 Free kick awarded for an unfair challenge on Michael Duberry by Darren Byfield. Free kick taken by Scott Shearer. 26:15 Matthew Richards decides to take the corner short. 23:05 Corner taken short by Matthew Richards. 22:32 Matt Phillips gives away a free kick for an unfair challenge on Rhys Weston. Free kick crossed right-footed by Matthew Richards from own half, clearance by Michael Duberry. 22:14 The ball is sent over by Scott Davies, Chris Zebroski takes a shot. Save by Clayton Ince. 20:37 Scott Davies is caught offside. Free kick taken by Clayton Ince. 20:00 Booking The referee cautions Chris Zebroski for unsporting behaviour. 19:42 The ball is delivered by Matthew Richards. 18:31 The ball is swung over by Lewis Hunt, Header from deep inside the penalty area by Matt Harrold goes harmlessly over the crossbar. 17:00 Booking Troy Deeney is booked. 16:23 Free kick awarded for an unfair challenge on Scott Davies by Troy Deeney. Free kick taken by Scott Davies. 13:16 GOAL - Scott Davies:Wycombe 1 - 0 Walsall Scott Davies grabs a goal direct from the free kick from long distance low into the middle of the goal. Wycombe 1-0 Walsall. 12:55 Emmanuele Smith concedes a free kick for a foul on Scott Davies. 9:27 The ball is sent over by Craig Woodman. 4:31 Shot from just outside the penalty area by Chris Zebroski misses to the left of the target. 3:13 Shot from outside the area by Chris Zebroski misses to the left of the goal. 2:01 Shot by Matt Harrold. Save by Clayton Ince. 1:33 Effort on goal by Netan Sansara from just outside the penalty area goes harmlessly over the target. 0:26 The referee gives a free kick against Darren Byfield for handball. Tommy Doherty restarts play with the free kick. Correction - 0:00 The ref blows the whistle to begin the match.